I brought my raw cakes plus some of my famous lentil patties, Karen and Jenni made some delicious dips. Jenni also made a nut-cheese that had the most gloriously creamy, subtle flavour, and Karen made some delectable raw veggie burgers in the dehydrator. A few people brought things that weren’t finger food but we quickly discovered you could spoon it onto cos lettuce leaves and eat it like that, in spite of the lack of forks! One of my favourites was a rice pasta dish. There was also some champagne melon from Marie, which was gobbled up in lightening speed, a glorious beetroot salad and some chocolate treats. It was such a lovely evening and everything ran very smoothly. Colin from Pimp my Disco awed me with his efficient management of the space and equipment. The crowd was warm and friendly and my dog wanted to kiss everyone. Took quite a bit of work to convince him to leave them alone and stay sitting with us. Blend all of this in the food processor until it looks a little like cooked cake. It will be loose and still slightly grainy (as per the picture below). 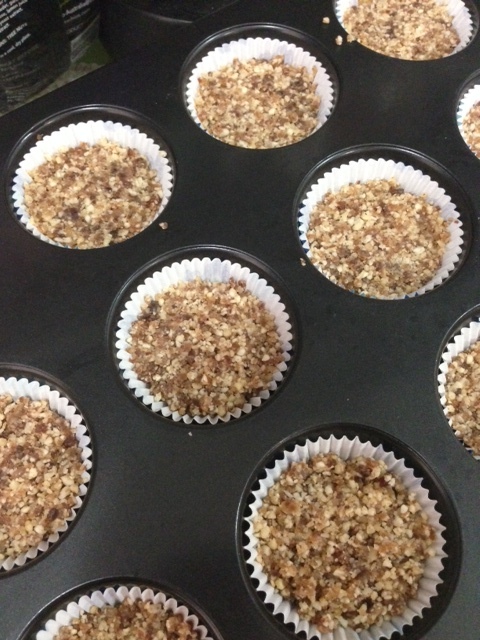 Then press this mixture in some cupcake holders… I used paper ones and then nestled these into a muffin tin for support. There is enough mixture to create 12 cupcakes. Now we need to make icing! For this, core 1 organic green apple. and blend it in the food processor with three dates and 1 cup of walnuts. I added a little lemon juice to mine, but that’s optional. You may need to stop and start the processor a few times, using a spatular to push the mix down when it gets stuck on the sides. It will be a bit lumpy and you will still see some green apple skin, but this adds to the rustic authenticity of the cakes! 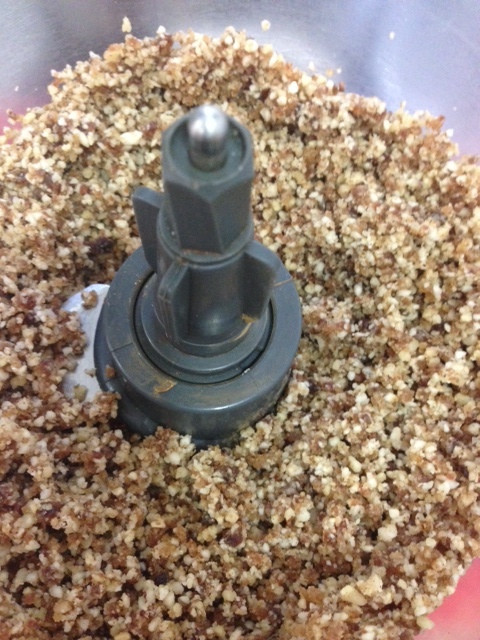 Then crush some walnuts with your mortar and pestle and sprinkle on top, and finish with a light dusting of cinnamon. You can eat these straight away, or put them in the fridge until you are ready to serve them. Let me tell you a little about apples while I’m here. For a fruit, they are quite high in fat… but being a plant, (and not separated from the whole food), this fat is very, very good for you. So is the fibre in apples, naturally! As so many of you are starting to discover, fibre is important for your bowel health and microflora. Apples also contain small amounts of calcium, iron, niacin, potassium, protein, Vitamin B3, sodium, vitamin B1, vitamin A and vitamin C. Contrary to popular opinion, small doses are good for us. More isn’t always better. Apples are healing for the digestive system, as well as possessing demulcent, astringent and tonic herbal actions. I could go on, but I have other jobs to do!